So I had a much needed day off on Sunday, yay finally, so myself and my beautiful boyfriend decided to go to a local shopping centre, this shopping centre had a ‘Victoria’s Secrets’, I had a browse but I have other expenses this month so didn’t buy anything. 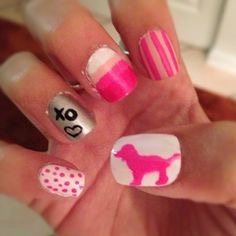 The first piece of ‘Victoria’s Secrets’ nail art I love is one that goes all the way, not only is the puppy super cute and pink, but these lovely hand drawn designs also include the beautiful angels logo and pink black on pink polka dots which I think really make this mani pop. My second pick to feature in this post is a pretty gold and pink number. 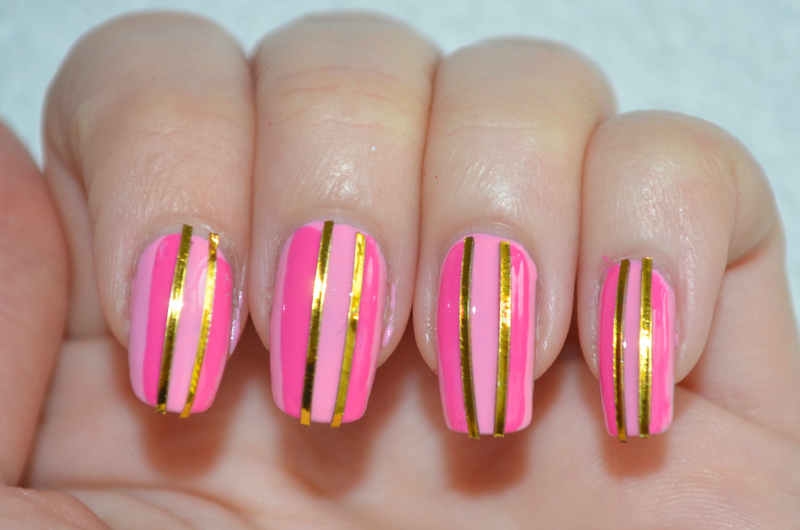 It’s very simple yet the two shades of pink coupled with the delicate gold lines gives this design a very vintage feel. For some reason this nail art design reminds me a bit of an old travelling circus or something like it, is it just me or can you see it too? I’d love to say a huge thank you to the the beautiful Miss Evie for this perfectly vintage piece. Although my third pick is more of s general design and it doesn’t really scream ‘Victoria’s Secrets’ as such I thought I’d still include it. 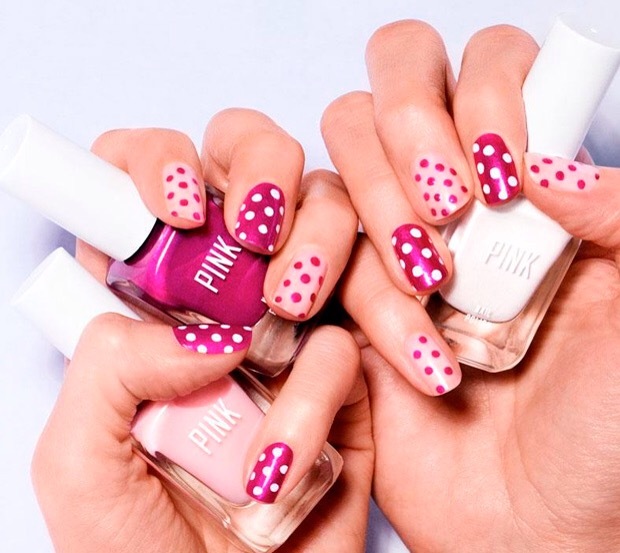 This nail art features a pretty spotty pink on pink and white on pink design. 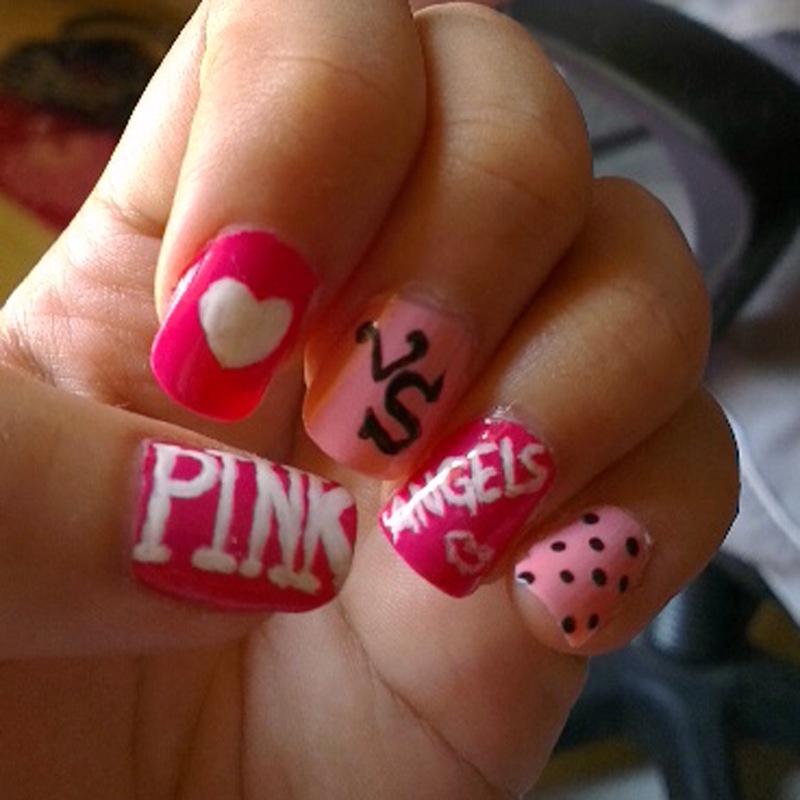 This perfect, simple and pretty for everyday wear yet it still shows the artists love of the ‘VS’ brand, not to mention the fact that it is painted with ‘PINK’ polishes. 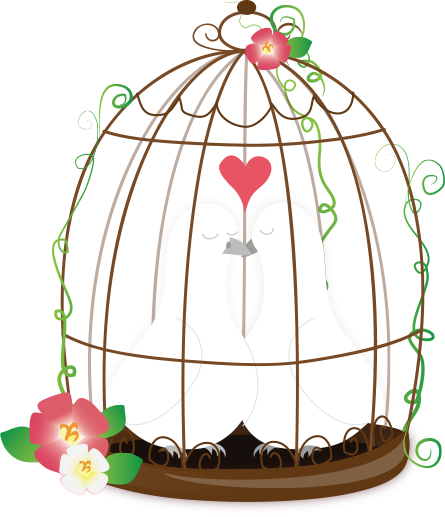 I’d love to say a huge thank you to Eumaquio for this pretty pink design. And finally I feel like this piece is perfect to end this post on as it incorporates aspects from all of the other designs to create one stunning final piece, I love the pink, the polka dots and the puppy, this design is ‘Victoria’s Secrets’ perfection. That’s all for now my lovelies, I’ll be painting my nails again at some point today, so stay tuned for my mani post.